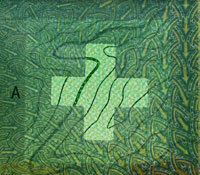 The 50 franc note focuses on the wealth of experiences Switzerland has to offer – expressed by the wind, the note’s key motif. The action depicted on the front of each note is a core element that runs through the entire series. 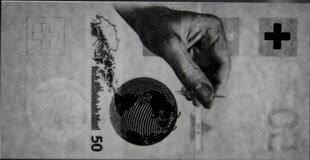 The fifty franc note shows a hand holding a dandyline and the wind carrying the seed. The wind motif can be found in several other places like wind arrows on the background or in the wind currents across the globe. The shimmering globe is another core element that appears on all banknotes of the series. It reflects how Switzerland sees itself as part of connected world. 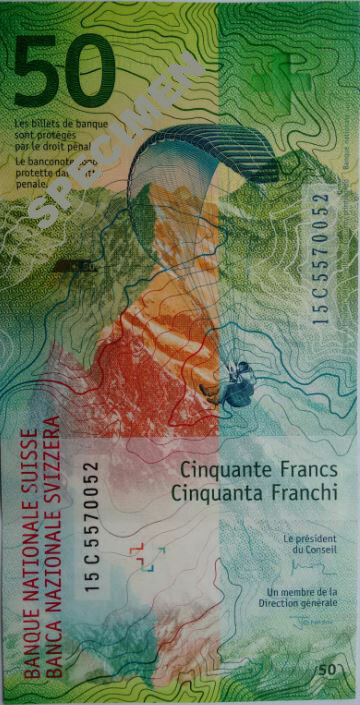 On the back of the banknote there is an image of paraglider. The mountain peaks in contour lines shows Switzerland varied landscape. 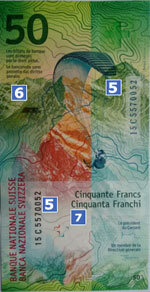 The Swiss franc 9-th series includes some inovative security features. 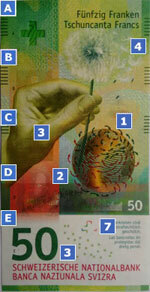 A number of different technologies are used to integrate the security features into the banknote design. That makes it easy for people to check if a note a genuine, using the tilt, magnify, feel and look method. 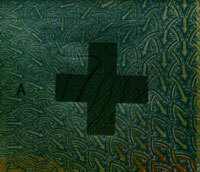 On the front of the note on the top-left there is a transperent Swiss cross. Hold it up to the light and it will turn into the Swiss flag. If you use magnifying glass you can see a micro text in the four national languages. The text forms the shape of the Swiss national flag. Some of the text is in dark letters on the light background and some are light colored letters on dark background. On the front of the note the Swiss cross is printed on the hand in such a way, that it can only be seen from a particular angle. Hold the note in front of you ad tilt it backwards. 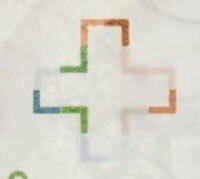 The Swiss cross stands out from the background. On the front of the note beneath the hand is perforated Swiss cross. This cross is made up of an equaled distanced holes. There are two watermarks- the Swiss flag and a globe incorporated into the note. If you hold the banknote up to the light on the left you can see outline of the Swiss flag and on the right- the globe. Tilt the note from left to right and you will see a golden arch moves across the globe. Hold the banknote in front of you and tilt it backwards. The color of the globe changes from copper to green. On the front of the note on the bottom half there is a security strip tilt the note from left to right. Red and green numbers appear on four lines and move on opposite directions. Slowly tilt the note backwards. The outline of Switzerland and Swiss Alps appear in rainbow colors. In addition to this little shining Swiss crosses are visible inside the number fifty. Run your fingers across the hand, the number fifty or the bank’s name on the four national languages. These three elements are easy to feel thanks to the raised print. On the front of the note down the long edges are series of short raised lines. They help the visually impaired people to identify the note. The number of lines are different in each denomination. 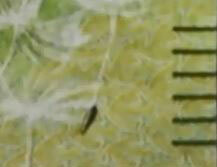 On the fifty franc note there are three sets of these tactile lines left and right of the banknote. 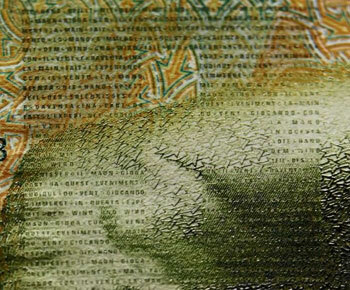 An identical serial number is printed on the back of the note in two places. It consist letters and numbers printed in different fonts. On the back of the note, below the number 50 is a triangle containing a glittering security thread. If you hold the note up to the light you can see the security thread extends across entire width of the note. The Swiss flag and number 50 appear at regular intervals along the thread. 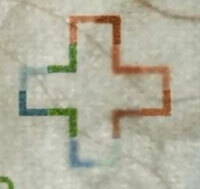 On both sides of the note incomplete Swiss cross features in the lower section. Hold the note up to the light and you will see the both fragments joining to form a complete Swiss cross. Printed on the front of the note on the top-right there is a globe that is invisible to the naked eye. The globe shows up brightly under UV light. 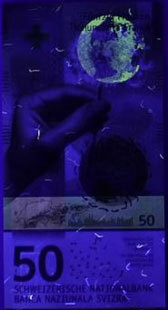 The paper on both sides of the note contains fibers which are visible only under ultraviolet light. They light up in different colors. On both sides of the note certain elements are printed using infrared absorbing inks. If you examine the note under infrared camera you will see that the appearance changes: some elements become monochrome and others disappear.